Do you have a boy who is just learning to read, or one who needs to practice his words a bit? These sight word games are perfect for him. Learning sight words is an important part of learning to read. Many times knowing these words give boys the confidence they need to feel that they can unlock the secret to reading. You are going to love these both for sight words and because they make great activities for boys. 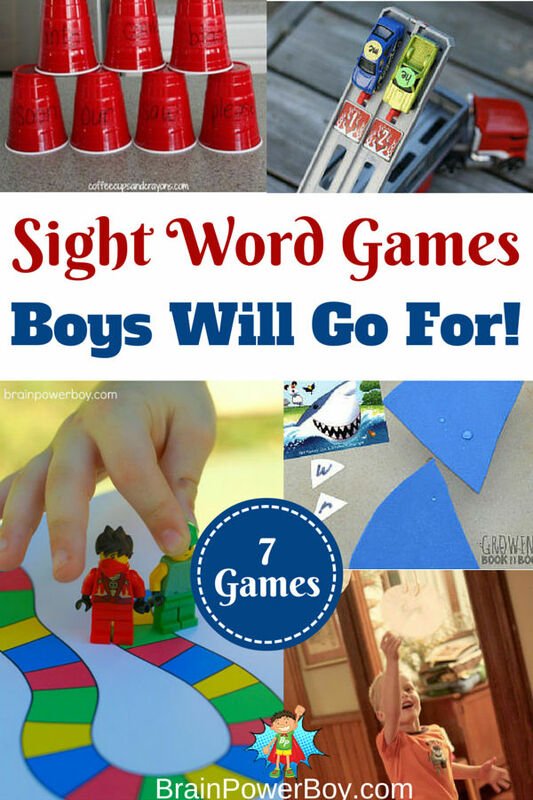 We found some very cool sight word games for you and your boys to play together. They are all on topics that boys like and they are all a lot of fun as well. Think about how excited your boy is going to be when he can recognize the words in these games and then sees them in a book and can read them. It is so rewarding for them. 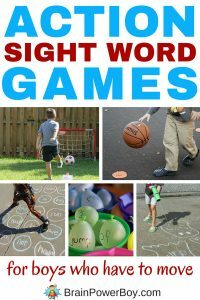 If you don’t have time to make a game, see our list of top sight word games to buy now. Rev up your boy’s engines with this Sight Word Drag Racing Game. Love the free printable drag race bracket to keep track of the winner. Fun! You know I couldn’t skip a game that includes throwing balls and crashing cups! Cup Crash Sight Word Game is a great way to include reading words, coordination, and a bit of target practice to boot. Aliens! This Roll-an-Alien Game looks like a lot of fun. It comes with a free printable sight word game board. You roll the dice to build your alien. Pretty cute, isn’t he? 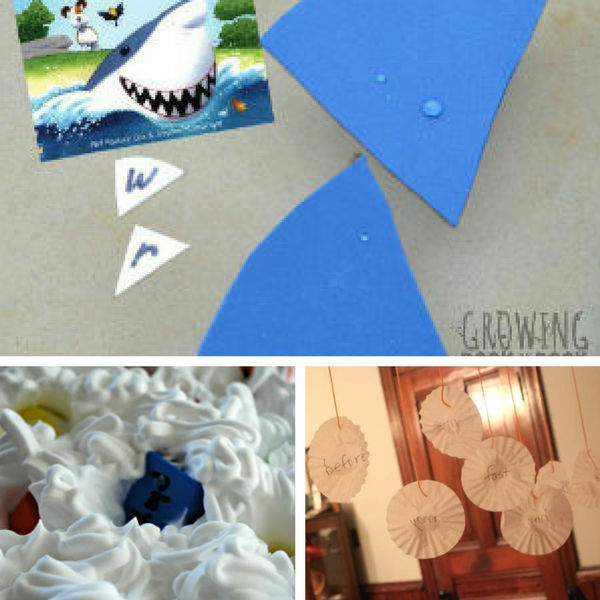 Try a Shark Sight Word Game that is played with water. Really neat because it uses shark fins with the words on them and shark teeth with letters. You find the teeth to match the words on the fin. Get them moving with this Jump and Grab Game. Words are hung up and they need to jump to grab them in this active game. If you have a boy who enjoys sensory play, or really likes to dig about and get messy, this is the game for him. The Sensory Sight Word Game is played with shaving cream. We have a really fun Free Printable Sight Word Game on the site that is played with LEGO Minifigs! We have gotten a lot of great feedback on the game. Parents and teachers say their boys love it. I hope you will try it with your boy. Make sure you are waiting until your boy is asking to learn new words and wants to learn to read. There is no benefit to pushing him to read but there can be harm in doing so. We are big fans of hands-on learning. It really does make for great activities for boys. 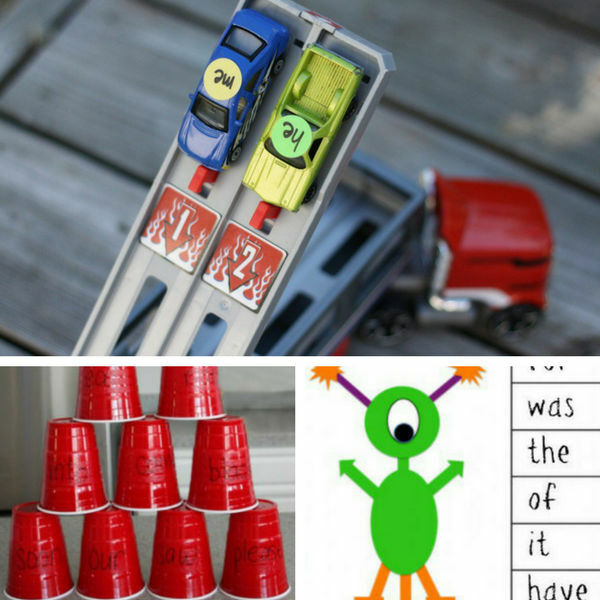 Have fun with these sight word games! Try Action Games too! These games are all about movement. If you have a boy who needs to move while he is learning you have to check these out. He will be moving and learning at the same time. One thing people have really liked about the collections we put together is that their boys ask to play these sight word games again and again. You can’t ask for more than that, right?! What a fabulous way to make learning sight words fun – I always think kids learn so much better when they think they’re “just” playing! Pinning this one to my homeschooling board! Thanks for the pin Clare – you know I agree about the learning/playing connection! I have 2 boys and they will love your suggestions! I have also picked you to be featured on Tuesday’s Laugh and Learn Linkup :-). we are in full sight word mode over here, these are great ideas! Great Susen, hope your kids enjoy them. Just wanted to let you know, I shared this on my blog today in a homeschool roundup. These are great ideas! My little boy is so active that I know fun activities like these will really work for him. Thanks Tina! Active boys really do enjoy these activities. Great ideas! I have three boys, so some of these would be great. I know they would love the Lego Mini figures, the Shark and water, and the shaving cream, of course Thanks for sharing!